In 1968 Stacey, Barbie’s British friend from England was introduced. She was made in only two versions; #1165 Twist 'n Turn (1968-1971) and #1125 Talking Stacey (1968-1970). She has blue eyes and two choices of hair colors; Blonde & Red (referred to as copper penny) In 1969 she got a cute new shorter style hair-do. Stacey ony had a total of three different hairstyles; ponytail, short flip, and side ponytail. She was the same size as Barbie, so they could share clothing. Her markings are: #1165 TNT: ©1966/Mattel, Inc./U.S. Patented/U.S. Pat. Pend./Made in/Japan, #1125 Talking: ©1967/Mattel, Inc./U.S. & Foreign/Pats. Pend./Mexico, and #1125 Talking 1970 markings: 1967/Mattel, Inc./U.S. & Foreign /Pats. Pend./Hong Kong. In 1968 Sears had an exclusive gift set (#1545 Stripes are Happening) ) which included the 1165 Twist 'n Turn Stacey in her swim suit and included extra clothes. It was first introduced in the 1968 Sears Christmas catalog. 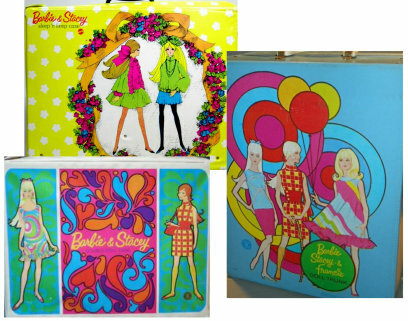 In 1969 Sears had another gift set (#1591 Night Lightning) which included the #1165 Short haired version of Stacey wearing a multi-colored one piece swim suit as well as extra clothing. Swimsuit for #1165 Stacey (1969) As you can see in 1969 the pattern was the same, but the colors changed around.